Posted on June 17, 2015 by academicbookfuture	in academic books, libraries and tagged British Library Additional MS 59678, Sir Thomas Malory, Winchester manuscript. Dr. Kevin Whetter teaches and researches medieval literature at Acadia University, Canada, and is the President of the North American Branch of the International Arthurian Society. In this post he considers the importance of the preservation of physical books; how the experience of reading is affected by the formats in which we read; and how valuable the work done by research libraries is for scholars. I was in London and the BL last week doing some work on what is hopefully a new book on Sir Thomas Malory’s Morte Darthur. I’m not sure what the academic book of the future will look like, but I know what an influential book of the past sometimes looks like: it looks like a medieval manuscript – because it is. For those who study manuscripts, this doesn’t need saying; but for those perusing a website about the future of the book, it might be worth considering. 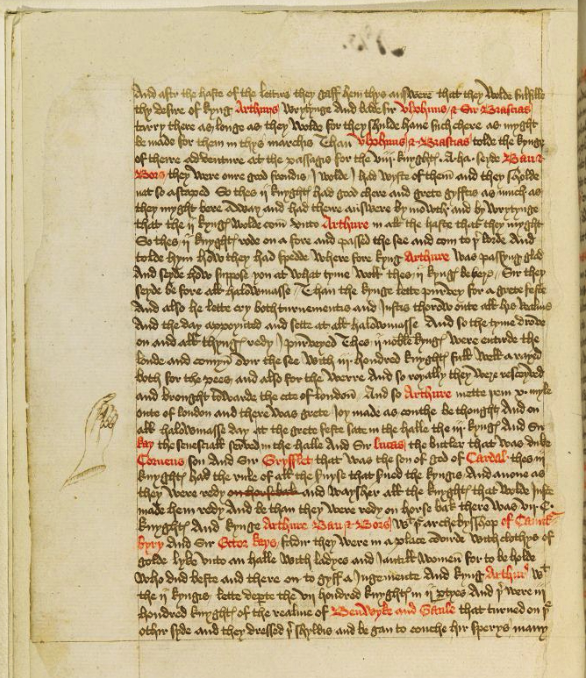 After all, Malory studies even today is shaped by the discovery in 1934 of the Winchester manuscript of Malory’s Morte Darthur, a manuscript now in the British Library, and catalogued British Library Additional MS 59678. The importance of the manuscript holds true even for those scholars who follow William Matthews in thinking that William Caxton (a fifteenth-century publisher) printed from a revision of the Morte made by Malory himself and evident in Caxton’s version of the Roman War story, but not in the Winchester manuscript. Thus whether Winchester is closer to Malory (as most of us believe), or superseded by Caxton’s copy-text (as Matthews and his followers believe), the manuscript remains central to the debate. Much of my own recent research to date has been enabled by two kinds of book: the old-fashioned (and monochrome) EETS – Early English Text Society – facsimile of the Morte’s manuscript, a book the Acadia copy of which spends more time in my office than on its library shelf; and the new-fangled digital version of the book available through the British Library or the Malory Project. Such digital facsimiles are now of course wide-ranging and hugely beneficial, allowing scholars such as myself, who live and work far away from any collection of medieval Arthurian manuscripts, to see what the manuscripts look like in colour. British Library Additional MS 59678, f.9v – a digitised page on the British Library website. And yet, for all the many scholarly benefits of such digital editions, we still, I think, need access to the originals – and so need libraries who can conserve and preserve the original materials and allow scholars and readers to access them directly. Part of my own book project, for instance, involves investigating possible connections between manuscript layout and contexts on one hand, and narrative and textual theme on the other. BL Add MS 59678, or Winchester as it is still sometimes called, has a unique colour layout whereby all character names, most place names, and some objects, including ‘Sankgreal’ and ‘Excalibur’, are rubricated in red ink. Obviously the black-and-white EETS facsimile cannot reproduce the colour. The online digital facsimiles can do colour, but not the effect of the old-fashioned reading experience, of turning pages and seeing what comes immediately from what went before. Until last week, all of my research about the Morte’s manuscript was done via the two facsimiles. But there is something unsettling, for me at least, about reading a book by clicking a mouse, and since I am investigating why the rubrication exists in the manuscript and what it might be for, part of my enquiry attempts to trace the effect of reading the manuscript version of the story. Thus part of my request to see the manuscript, which is highly restricted, involved the claim that, for all of the benefits of digitized manuscripts for modern researchers, medieval readers did not use computer screens or mouse pads, and modern research needs to make sure we do not misrepresent the original reading experience. Hence, I said, I needed to examine Winchester directly. There were many other justifications (it’s a long application form), but for the relevance of the book of the future and important books of the past, that was the key point. And it (and the others) worked: I was eventually granted access to the unique manuscript copy of my beloved Morte Darthur. And the experience did indeed allow me to form conclusions and make discoveries that I missed when reading in black-and-white or online, discoveries in fact that are really only apparent in looking directly at the old book itself. Having spent some time with the manuscript, I can also say with conviction that neither the EETS facsimile nor the online facsimile produce the sheer awesomeness of the reading experience, of looking directly at a book that brings us as close to Malory as we are ever going to get until the human species perfects time travel. This closeness can only come about through the old books, the manuscripts, directly. And for preserving those books and giving us access to them, we are all profoundly indebted to our major research libraries. As for being able to touch the manuscript directly, it was, of course, bloody marvellous! So marvellous that I nearly spilled my post-reading drink after the manuscript went back to its safe — almost. Posted on June 12, 2015 by academicbookfuture	in academic books, Publishers and tagged monograph, open access. Guest post by Jen McCall – Global Head of Humanities, Scholarly Division and Publisher, Theatre & Performance at Palgrave Macmillan. Jen discusses Palgrave Macmillan’s short-form monograph, the Pivot – what prompted the development of this publishing format; how it operates within current contexts of publishing, academia, and the REF; and how the academic book of the future must be flexible. The idea for our mid-length research format, Palgrave Pivot, came from conversations such as these. Most scholarly journal articles are between 7,000 and 8,000 words in length, while most academic print books published are between 70,000 and 110,000 words, and historically there has rarely been any flexibility in this due to the methods used, and costs involved, in the printing process. However, the scholarly publishing landscape has been changing for a number of years, and the advent of ebooks means that we publishers are less restricted to word counts and page numbers than once might have been the case. In a digital world, we are not bound to the printing costs which once defined the size of a monograph, and the page numbers which must make up one issue of every journal. The academic book of the future need not be so restricted. Prompted by these changes in the scholarly publishing landscape, in 2011 Palgrave Macmillan undertook a programme of research designed to explore how our academic audience both uses and produces research. First we established a research panel, with 1,268 representatives from across the whole Humanities and Social Sciences community, representing a wide range of disciplines and geographies. Almost two thirds of academics (64% of the 870 who responded to the survey) felt that the length of journal articles was about right, while for monographs this figure was slightly lower at 50%. A number of authors (36% journal article authors and 50% monograph authors) were not satisfied with the formats available to them, with almost all those who felt that the designated length was not right saying (in both cases) that the length was too long. The results showed that 16% believe that current outputs (journals articles and monographs) are sufficient. Some, who felt that a mid-form was a good idea or who were neutral, were asked how likely they would be to publish research in a format between the length of a journal and a monograph: 84% (n=705) indicated that they would be likely to publish in this length. Speed of production times also proved to be a key issue for the academics we surveyed. During the qualitative research phase, Neil Chakraborti, Senior Lecturer in Criminology, University of Leicester, UK, commented on the needs of ‘scholars seeking to disseminate their research while it is still fresh and current’. Likewise, Jane Fitzpatrick, Acquisitions Librarian at CUNY Graduate Center, USA, described the need “for timely research in the digital world. The Humanities and Social Sciences have been left behind in the immediacy of published research […]. As we know, ‘speed’ and ‘innovation’ are key in the current world of scholarly research”. As a result of our market research, we developed the idea of Palgrave Pivot; an e-first book format for important and new scholarly research, between 25-50,000 words, to be published within 12 weeks of acceptance of the manuscript. Print copies of the books are also available on demand, so that those who prefer to hold the physical copy in their hand can do so. Of course, the mid-format has been explored by other publishers over recent years. In November 2010, Springer announced SpringerBriefs for works between 50 and 125 pages in length. SpringerBriefs are concise summaries of cutting-edge research and practical applications across a wide spectrum of fields. 2011 saw the launch of Princeton Shorts, brief selections taken from previously-published influential Princeton University Press books and produced exclusively in e-book format. But Palgrave Pivot is the first initiative to offer a mid-length format for original research in the humanities and social sciences, rather than summaries of existing work. How do we publish Palgrave Pivots so quickly? In order to make this speedy production time work, we have had to revise and adapt our business workflows substantially. For example, one of the areas that usually takes time in the production process is that of choosing a cover design, which often involves some back-and-forth between design, marketing, sales, editorial and of course the author, as well as having to gain rights permission for images used. For Palgrave Pivot, rather than having individually designed cover designs, authors are required to choose from a wide range of beautiful templated designs, custom designed by our in-house team. Authors also have to agree to answer any queries from copy-editors and typesetters very quickly; this infographic gives a clear example of how the process works from an author’s point of view. We have been very careful, along with our commitment to publish Palgrave Pivot titles within a short timeframe, to ensure that the quality of the peer review is in no way compromised. Palgrave Macmillan prides itself on the quality of the research we publish, and we would not have been able to maintain our reputation for quality work without rigorous peer review. 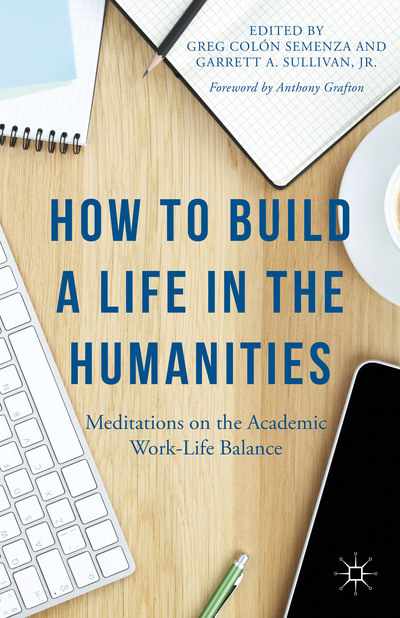 We are well aware that it is not just the scholarly publishing landscape that is changing – it’s also the changing demands of a life and career in academia. For example, we ensured that we met the stringent requirements of the Higher Education Funding Council for England and have obtained written confirmation that that research outputs published with Palgrave Pivot are eligible for the UK’s Research Excellence Framework (REF) – subject to all other criteria being met. The first 21 Palgrave Pivot titles were published on 30 October 2012, and we immediately received lots of positive feedback from the scholarly community (as well as a rush from many scholars to publish one ‘just in time’ for the last REF!). Palgrave Pivot has allowed us to offer our authors the flexibility to publish their research at its natural length and in a variety of formats. Nowhere on our list is this better exemplified than in Medieval studies where our series the New Middle Ages publishes Pivots as well as full length monographs, and that, along with our postmedieval journal has opened up the field with options that any generation of scholar can embrace, giving the field of Medieval Studies more ways to communicate their research. The speed of the production process gives our authors in the humanities opportunities to publish work which is timely or time-sensitive. This means, by way of example, that we could maximise the impact of the work of Joseph Cheah and Grace Ji-Sun Kim in their book Theological Reflections on Gangnam Style. Without the speed that this publishing format offers us, it just wouldn’t have been possible to ride the wave of the popularity of this phenomenon. Another Pivot, Digital Afterlives of Jane Austen, a fascinating look at the ever-expanding realm of Austen fandom on the Internet, was reviewed on the LSE’s Impact Blog. In 2013, Palgrave Macmillan announced an open access option for authors of Palgrave Pivot publications, as well as for research monographs, and we published our first open access Palgrave Pivot in 2014, Seeing Ourselves Through Technology by Jill Walker Rettberg. Two years on, we have published over 200 Palgrave Pivots across business, the humanities and social sciences, at an average speed of 10 weeks. Our shortest title so far has been just 78 pages, while the longest has been 196. It is fair to say that Palgrave Pivot has proved to be a popular format, both in terms of its speed and flexibility on length; and we believe that the academic book of the future will need to be similarly flexible if it to meet the demands, not just of the changing scholarly publishing landscape, but of the changing demands of a career in academia. Posted on June 4, 2015 by academicbookfuture	in academic books and tagged books. Project Team Member Nick Canty visited Berlin last month for the annual meeting of the Fiesole Collection Development Retreat Series. In this post he reports on the Retreat, and some of the emerging themes, issues, and developments with relevance to the academic book and its contexts. The Fiesole Collection Development Retreat is an annual gathering of those with an interest in the future of scholarly communication who want to share in the debate. The two day conference has no accompanying exhibition or major sponsorship – the focus is on an open exchange of ideas across libraries, publishers and researchers – not always groups that see eye to eye, and often with different vocabularies. What follows is a discussion around presentations which closely relate to the academic book and this research project. But why Fiesole? This lovely town outside Florence was where the original conference was held in 2000 and although the conference now travels around the world, the original title has stuck. The theme of the 2015 gathering was ‘Competing in the digital space: evolving roles for libraries and publishers’. The conference started with a focus on collection development. The University of Lille outlined public initiatives in relation to HSS research. A monograph in France now sells approximately 300 units and is still seen as central to excellence and part of the identity of the researcher. The CAIRN project (cairn.info) is looking at improving access to French schools of thought in English and French and has been running since 2005. Some 3000 articles have been translated in HSS. The OpenEdition project is a publicly funded research infrastructure based on a freemium model, moving from plain HTML to added value PDF and epub versions, with two thirds of the revenue going to the publishers and one third to the platform developers. The final French project was Persee, a digital library built by researchers and publicly funded, giving free access to HSS journals. Persee contains over 500,000 documents including books. Half of Persee’s audience is domestic to France and the rest is international. Persee is looking to include grey literature and give access to iconographic material. The Max Planck Institute, Berlin (History of Science) explained how they have launched digital journals and run virtual exhibitions (Pratolino Garden Project) based on the resources around the construction of the Florence cathedral. The journal ‘Years of the Cuppola’ contains peer reviewed articles based on original documents which detail the construction of the cathedral with insights into the lives of the workers, their pay and eating habits as well as design and engineering elements. These journals were set up and run by the department, generating several questions about resourcing and staff time. We were assured that this publishing operation was run on a limited budget from the department and resourced by an administrator and a student. Future plans for the collections include visualisation of historical data, eg treaties in the fourteenth century based on small world network theory which shows the spread of treaties across Europe and the expansion of knowledge from this. Lluis Pastor from the association of Spanish university presses (Unión de Editoriales Universitarias Españolas) outlined the work of the association. There are 66 university presses in Spain covering public and private and research institutes publishing over 60,000 books, representing 7% of all publishing in Spain and 25% of all non-fiction titles making the association one of the largest publishing groups in the country. To increase visibility of their work they have launched a portal which gives access to their members’ catalogues (unebook.es) and over 55,000 documents with plans to open to this to university presses in South America. A challenge for the association is demonstrating quality to research funders, quality agencies and government when there is a belief that commercially published books are of a higher standard than those published by the university presses. To counter this they are encouraging their members to specialise in disciplines and work to attract authors from overseas. Alison Mudditt from the University of California Press addressed sustainable Open Access publishing based on community approaches practised by the press. The first model, Collabra, charges $875 per article. After Press costs $250 can be paid forward into a research community fund or taken as a cash payment. Their research shows just under half of their respondents take the sum as payment with the rest paying it forward either towards their institution/library fund or future author waiver fees. The Luminos monograph model has a baseline publication cost of $15 which increases with complexity of the content. The author’s institution is expected to contribute $7500 per title. The Press is currently losing approximately $10,000 per monograph and sees the Luminos model as a sustainable way forward. Other relevant presentations worth mentioning includes that by Charles Watkinson of the University of Michigan Press. Watkinson looked at open access monographs and the incentives for authors. He made the point that while HEFCE, OAPEN UK and others describe the benefits for publishers, funders and libraries they are vague about why Humanities authors would really want to publish an OA monograph. The University of Michigan Press has two Mellon Foundation projects running, one looking at how authors feel about OA books, and a second creating a platform to meet these requirements. The projects are concentrating on the Michigan OA series ‘Digital Culture’, and a white paper with results should be available in September. Adriaan van der Weel of Leiden university asked how digital the book of the future should be, and identified a clash of interest between reader and author interests. The author interest was intellectual first (scholarly communication, publication) and then economic (tenure, promotion etc) while for the reader intellectual interest, discovery, access and finding information were priorities, and economic issues were around the economy of attention and reading as little and as efficiently as possible. Finally, Thomas Stacker considered the use of books beyond reading, looking at distant reading (Sosnoski), machine reading (Hayles) and hyper-reading (Moretti). Assuming the necessary requirements were in place (full text, metadata, semantic encoding and open access among others) he demonstrated how analysis tools, specifically stylometry, topic modelling, cluster analysis and voyant tools can be used to analyse a text or corpus.